Dr Poulos can provide dental implants to replace single or multiple teeth, seamlessly restoring your smile with single implant crowns, or with implant supported bridges or dentures. It is worth considering treatment whether you are just missing a single tooth, or if all your natural teeth have been removed. Why Consider Single Dental Implants? 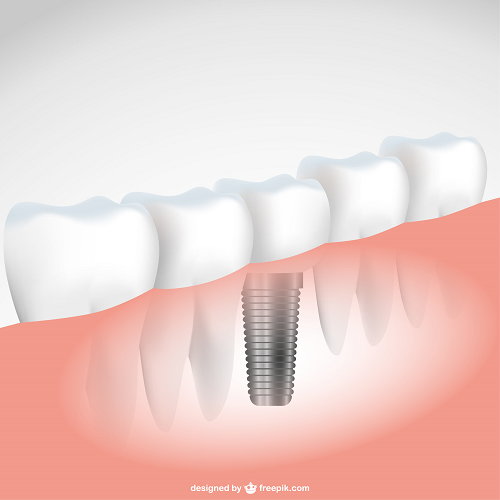 Single dental implants can replace teeth in a way that looks and feels amazingly natural. Just like a real tooth, your implant crown will emerge from your gums and it would be extremely difficult for anyone to tell it isn’t your own tooth. Dr Poulos will take enormous care when designing your implant crown, to ensure the colour and shape blend in beautifully with your own teeth. Single dental implants are very easy to maintain as they can be brushed and flossed just like your natural teeth. Multiple implants are ideal for replacing multiple teeth. You won’t need to replace every single tooth with a dental implant, as relatively few are needed to support even quite large dental bridges. It can be the ideal solution if your existing natural teeth are too weak to support a bridge and will provide you with strong and stable teeth that will allow you to smile and eat with complete confidence. Please take a moment and check out our Gallery to see some of Dr Poulos’ beautifully restored implant crowns.